I returned from Brussels a couple of days ago, where I went to present KANTS: Artificial Ant System for Classification (the model was already described here) at the 6th International Conference on Ant Colony Optimization and Swarm Intelligence. 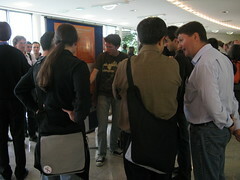 ANTS 2008 is similar to PPSN, with most of the papers being presented at poster sessions (only a few are chosen for oral presentation). This procedure works well when the poster sessions are not just a minor event of the congress, thrown to a distant room in the hotel/university where nobody even bothers to go, or scheduled to the end of a long day. ANTS sessions were well organized and every poster had an assigned space. My presentation was scheduled to the last day of the congress, when most of people had already packed for their trip back home, but nonetheless the session went well, with lots of people wandering around the room, clearly interested in the works. KANTS got the attention of some audience, and I think they were quite impressed by the simplicity (and efficiency) of the idea. The inevitable question arouse (are you planning to test KANTS on a real-world problem?) and this time we can answer yes, we are not only planning to do it, but we are already working on it (later we will report on those experiments). In the same section, another swarm-clustering was presented. I saw the poster, and the results on clustering appear to be quite good (but the system does not perform classification). I haven’t read the paper (as a matter of fact, it is published as an extended abstract), but I was able to realize that the algorithm is little bit complex, simulating the behavior of three different species: ants, birds and spiders. A week before I was in Barcelona, at the 8th International Conference on Hybrid Intelligent Systems (HIS 2008), presenting the paper Tracking Extrema in Dynamic Fitness Functions with Dissortative Mating Genetic Algorithms. It is quite a different work, and more related to my thesis’ subject, bio-inspired computation on dynamic environments. It describes the experiments performed with an adaptive dissortative mating GA (ADMGA) on Dynamic Optimization Problems. Dissortative mating appears frequently in nature and refers to the occurrence of mating between dissimilar individuals more often than expected by chance. It maintains genetic diversity at a higher level, thus increasing the exploration stage of the algorithm. Dynamic fitness functions are more sensible to genetic diversity than static ones, and so dissortative mating is a good candidate to deal with that kind of problems. The paper describes mainly the experiments performed with trap functions and show that ADMGA may improve GAs on some dynamic optimization scenarios. Robustness is also addressed and results show that ADMGA maintains a more stable performance over the wide range of dynamic scenarios. The congress HIS is mainly dedicated to hybrid models and real-world applications, so ADMGA was somewhat “lost” among other works. But good news came after the congress, and this line of research will probably make its way through other media. P.S. In Brussels, avoid Hotel Continental, near Midi Station, unless you need inspiration for another insects’ heuristics. Last friday I returned from the First Ferguson World Tour Of Science. I was traveling around Europe in order to present some things about my research. 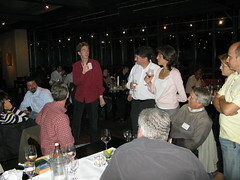 First we arrived at Dortmund, Germany, where the Parallel Problem Solving from Nature (PPSN 2008) was celebrated. There I presented my paper “Evolving XSLT Stylesheets for Document Transformation” that you can download from here. I hadn’t any problem explaining it. Nobody came to complain about colours, XML future, or typos in the word “Conclusions”. Oh, wait, I could remember… no, nobody came. Here you can see me doing some magical science. Mmmh, who will be these guys sitting in that table? After that I went to Castellón (Valencia, Spain) to present my paper “Algoritmos evolutivos distribuidos sobre dispositivos Bluetooth” (in Spanish, as you can see, but you also can download from here). 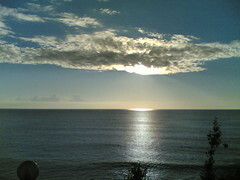 I’m uploading my own photos to my Flickr account. Just to say that it has been an awesome travel around the world! I met a lot of interesting people and learnt a lot. Yeah, I really love the researcher’s life. The title of this post is due to today I received my MSc degree (I presented this paper in Granada, where I am a grad student). Next week, Carlos Fernandes will present in the ANTS 2008 conference our paper KANTS: Artificial Ant System for Classification (hope the typo is not in the proceedings, but I’m afraid it will be). The algorithm was already presented by Antonio in ALIFE XI, with the paper KohonAnts: a self-organizing ant algorithm for clustering and pattern classification (which is also available from arxiv). Antonio was questioned about what was good about this algorithm, and I guess this is as good a place as any other to tell about it. The basic idea of Kohonants is to use stigmergy for clustering and classification. Usual ant clustering algorithm place data as objects in the grid ants move around, and then, via some natural inspiration and a great deal of heuristics, they manage to cluster them according to proximity. Kohonants, on the other hand, makes each data item an ant (or several, if needed). Pheromones are also vectorial in nature, in the same dimension as data, and what ants do when they move about is first take into account what’s the pheromone levels they have around in their neighborhood, and second modify it making them closer to the vector they represent. That is why they are called Kohonen’s Ants: Kohonen’s algorithm behaves in the same way. Takes a training data vector, compares it to all the vectors in a two-dimensional array, and whoever wins is made closer to the data vector. Ants in Kohonants take the place of data vector in Kohonen’s algorithm, and the two-dimensional vector array that is trained is substituted by the two-dimensional (vectorial) pheromone field in Kohonants.